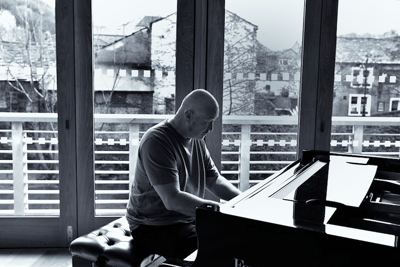 I’m David Nelson and I’ve been teaching piano for over 35 years and for much of that time I’ve been based here in Hebden Bridge, West Yorkshire. Born in London, I have lived in the Yorkshire Pennine town since 1984 and been making music locally ever since. If there’s music going on here there’s a good chance that I’m involved. A freelance musician, some of my work over the last 20 years has involved workshops and projects for schools, colleges and community groups. I am a professional pianist (playing classical and jazz, both solo and in various ensembles), a private teacher (piano, theory, composition, songwriting) and a composer for the various ensembles I have performed with, and of other music (eg for theatre) by commission. I also sing, play acoustic guitar, bass guitar and percussion, and have worked with and composed music for most orchestral and many non-western instruments. I was the Music Director of Hebden Bridge Arts Festival for 16 years and now direct Hebden Bridge Piano Festival. I also run an annual series of concerts at Wainsgate Chapel in Old Town, Hebden Bridge. Based in Hebden Bridge, West Yorkshire, I’ve been teaching piano for over 35 years, with students from Halifax and around Calderdale; also from Bradford, Leeds, Manchester and points both in between and beyond. Click here to find out more. Also find out about day-long lessons and weekend-long lessons. I have a set of values and beliefs which influence the way lessons are taught. I strongly believe for example that everyone is capable of playing a musical instrument and that everyone has musical potential. Also that it is important to encourage and develop a wide range of musical skills (such as sight reading, ear playing, rhythm sense, improvisation, harmony and singing) because these skills are essential in piano playing and in being a musician. I also believe that lessons should be fun! As a teacher, I feel that it is important for me to also be working in music as performer, composer, workshop leader etc. These other aspects of my musical life bring to my teaching a very different and interesting quality which is appreciated and understood by students. Whilst it is true that most performing musicians want/need to also take on educational work, it is sad that so many instrumental teachers no longer wish to perform or create music. I intend to save that kind of inertia until my nineties! Click here to find out more. I am the Director of Hebden Bridge Piano Festival and also organise music events at Wainsgate Chapel. Sign up here to be kept in touch with what’s happening.